Savor four days of sumptuous chef-helmed happenings. 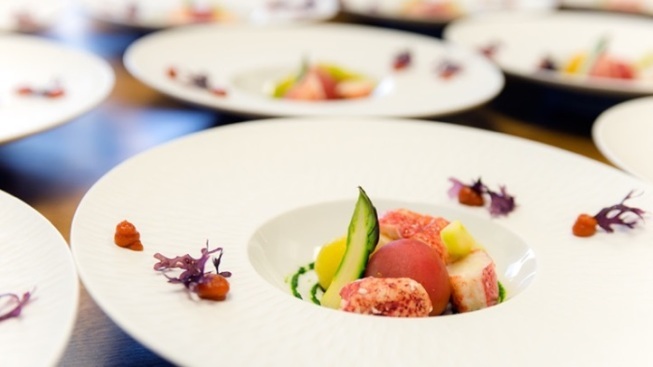 Savor four days of sumptuous chef-helmed happenings from Feb. 25 through 28, 2016. A QUARTET OF CUISINE-PACKED DAYS: Two disparate foods that go very well together? We can all name at least a few dozen, from peanut butter and jam to milk and cookies. But quite often food festivals and locations meld well, too. Look to the Central Coast, and the Monterey Bay area, in the late winter and springtime, and look to top-notch food festivals brimming with excellent bites and the famous toque-wearers who create them. The area, the time of year, and the taste-driven spectacles have become something of a staple on the sup-seeker's calendar, a calendar that definitely has the Relais & Châteaux GourmetFest written in pen. You know this feasty four days if you're up on your L'Auberge Carmel and/or Masters of Food & Wine history (and we'll just be bold and assume you definitely are): David Fink, the proprietor of L'Auberge Carmel and founder of the Masters, created this winter reverie to spotlight some of the best Relais & Châteaux chefs around. If you've ever stayed at a property with the fleur-de-lis-like iconography front-and-center'd, then you know that the company is famed for its fine food and propensity for featuring Michelin-star'd chefs. And some of those chefs will make for Carmel-by-the-Sea over the last four days in February, all to celebrate really good eating in a host of ways. THOSE WAYS INCLUDE... a Welcome Party brimming with estate vinos and excellent brews, as well as stations helmed by a trio of Michelin-accoladed artists d'cookery. A Rarities Dinner is a "meal of a lifetime" that includes 10 courses (yep, 10 courses) and rare wines hailing from the Chateau, Domaines, and Estate cellars. And a Wild Mushroom Hunt and Lunch at the glorious Santa Lucia Preserve. It's a feastable four days, for both the palate and the whole person, and one with a tony yet approachable air. Cuisine-driven tour de forces don't come along every week, and definitely not in such delightful settings. Ready to get to know the noshables of some of the best chefs working today? Read more here about all the events -- there are more than just mentioned -- and get to planning your Carmel idyll.